On September 25, 1907, Wheatland Union High School opened on the second floor of the grammar school with 23 students. The first principal was Professor J. C. Ray, a 1891 graduate of the first Chico Normal School class, who received an A.B. degree from Stanford University in 1902. He had organized the Sutter County High School, the largest in the state. Two teachers taught a course of liberal studies that prepared pupils to enter Stanford University, the California State Normal schools and the colleges of the University of California: Social Science, Natural Science, Commerce, Agriculture, Mining, Civil Engineering, Mechanics, Chemistry, Law, Medicine, Dentistry and Pharmacy. In 1910, a District High School was established, serving a small population in the thinly-settled farming region. In 1923, a Union High School District was formed, taking in Wheatland, Virginia, Elizabeth, Waldo and Lone Tree Districts, with the school still known as Wheatland Union High School. A new High School was built in 1924 and dedicated in 1925, with four teachers. In 1927 the gymnasium was completed, and in 1929 a Quonset hut-type building was added to house the shop and agricultural classes. 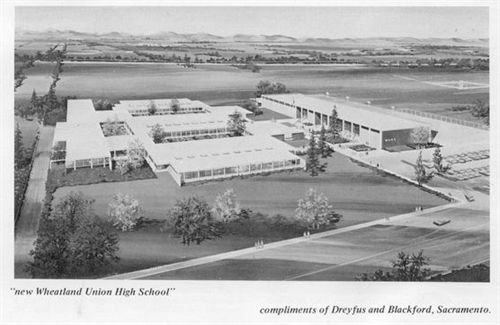 By the late 1950's, the student body of Wheatland Union High School was less than 100 students, but growth was foreseen and a bond issue was approved in 1959 to construct a new High School. The new High School was completed in September 1961, with the gymnasium completed in December and full occupancy in January 1962. The architect of the new high school was Leonard Dam Blackford, a former student. The $4 million high school included a library, girls' and boys' gymnasium, outdoor community circle for entertainment, the Commons, lighted tennis courts, football field, baseball field, track facilities, shops, and forty-one classrooms. Wheatland Union High School now has more than 700 students.